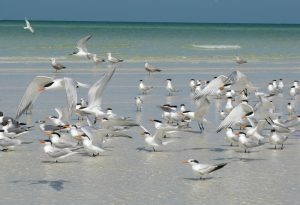 When visiting the Florida West Coast, you are guaranteed to see birds. Not just any birds, either. We’re not talking about sparrows and pigeons. We are talking about large exotic birds that you usually don’t get to see outside of Florida. You don’t have to go anywhere special to find them. They are right there with you wherever you happen to be in the central or coastal regions. Florida has so many birds, covering them in one blog just isn’t going to happen. The species we’ve chosen here are the ones we see the most. Plenty of other common birds will fly or walk by that we haven’t named here. Feel free to create your own list. The most common birds you will see in inland areas are the white ibis, great egret, snowy egret, skimmers, wood storks, and osprey. All of the birds on this list enjoy living next to open water and in inland areas, that means lakes. All of the birds we’ve named here are wading birds except for one, the osprey. 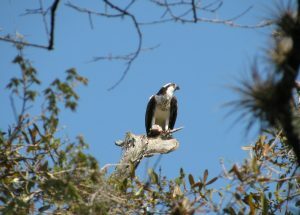 The osprey is a fishing hawk. It is a raptor that survives solely by eating fish, leaving squirrels and mice alone. 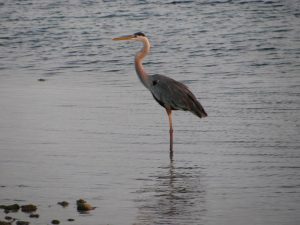 All of the others will be found wading in the shallows of the lake, stalking the shorelines, or sitting in trees nearby. Some of the larger ones, the great egret, in particular, has mastered the art of begging for treats from humans. Before you feed them, be aware their diet consists of fish and lizards which means your human food might make them sick. While most people visiting the Florida West Coast are aiming for the beaches, it is still possible to wind up in or near mangroves. Mangroves are a common type of short tree that can survive in or near salt water. They are difficult, if not impossible, to navigate on foot and that makes them perfect habitats for animals. Every bird on this list can be found taking advantage of mangrove trees as temporary roosts or permanent homes. It is always a special treat, however, when you can spy night herons taking shelter within the tangled branches or roots of mangrove forests. Another treat, admittedly a little spookier, is when a night heron takes flight from nearby, usually unseen beforehand. They also fly rather low and have dark feathers, so if you find a large unidentified bird fly right over you in the darkness, it is probably a night heron. While that can be startling, none of Florida’s birds have any interest in attacking humans. Considered a bit rare, the roseate spoonbill can be seen frequently on the Florida West Coast when in the proximity of mangroves. The roseate spoonbill has bright pink feathers and feeds in the muddy shallows where mangroves grow. You may see wood storks joining them. Wondering which of these birds on our list like to come down to the beach? Well, it’s the beach. They all want to be there. 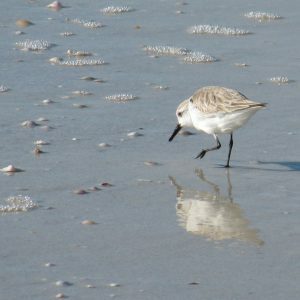 Two bird types on our list that you will find at the beach more than anywhere else are pelicans and sandpipers. 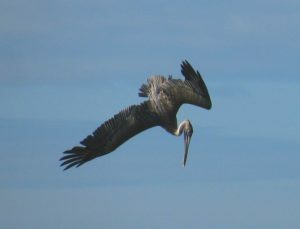 The brown pelican is common to our area although other pelican species migrate through our area. The brown pelican is a large bird and it also begs for snacks from humans. Unfortunately, they are large and can react aggressively, making them a poor choice as a cute bird to feed. Sandpiper varieties are too many to name in this blog. You will find this species walking the shoreline, poking its beak into the sand to find goodies hidden below. 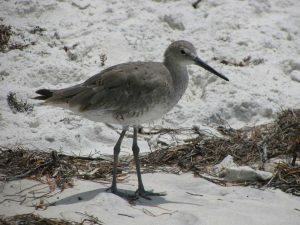 A few are larger and behave like wading birds while others are so small they have to run up and down the beach avoiding the smallest of waves. We’ve sold short the very long list of birds in our area and we know it. Florida is a birdwatcher’s paradise. Anywhere you go, you will see large, exotic birds flying by or walking past. We recommend getting ahold of a chart that describes the birds of the area. Kids love checking off lists of the birds they’ve recognized. 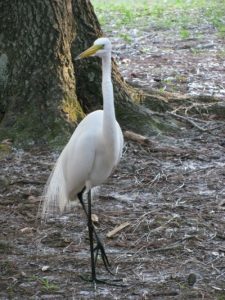 Whether you get involved in birdwatching or not, be sure to appreciate these regal Florida residents when they cross your path. They add a special bit of life to any stay in Florida. Can You Get Married on Clearwater Beach?